1. Philip Rivers, quarterback, San Diego. He just keeps getting better. Building on last year’s 5% improvement in completion percentage—stunning for a 10-year vet—Rivers came back after a one-point loss to unbeaten Arizona to strafe three straight foes, most impressivly leading the Chargers to 30 points in a Week 2 win over Seattle. The thing you notice about Rivers now is that his confidence isn’t getting him in trouble the way it did under Norv Turner—he’s forcing very few passes. He’s a 74.5% passer during the three-game streak, with no interceptions. 2. DeMarco Murray, running back, Dallas. Jerry Jones might have hated picking Zack Martin over Johnny Manziel in May—you know he did—but he wasn’t hating it Sunday night, basking in the glow of a 38-17 rout of New Orleans. “I don’t recall ever seeing a Cowboy team in my 25 years play better, including the effort and including mistake-free execution, than we played in the first half," Jones said. It’s ball-control. It’s spending high draft picks smartly and conservatively on offensive linemen. It’s handing it to Murray, who can make people miss or road-grade them. He’s got a ridiculous 156-yard lead in the rushing race after four games, and four 100-yard games in the Cowboys’ 3-1 start. 3. J.J. Watt, defensive end, Houston. What else can a defensive player do? Watt has caught a touchdown pass, blocked an extra point, had two sacks, forced an intentional grounding, batted down two passes, returned a leaping interception 80 yards for a touchdown, recovered a fumble and, on Sunday against Buffalo, had nine quarterback pressures of E.J. Manuel. It’s Sept. 30, and 3-1 Houston has already won more games than it did in all of 2013. Credit Watt. 4. Russell Wilson, quarterback, Seattle. At the helm of the best team in football, Wilson has completed 69% of his passes, thrown just one interception and done what he had to do when he had to do it. Four runs and four completions were what it took to drive the length of the field on the first possession of overtime to beat Denver in Week 3. John Stockton never led the NBA in scoring, and Wilson will never lead the NFL in passing yardage. Wilson is a point guard, an excellent one. 5. Peyton Manning, quarterback, Denver. It was either Manning or Andrew Luck, with some sick numbers, here. The six-play, 80-yard, no-timeouts-left, 41-second drive to tie Seattle eight days ago clinched it for Manning. Just a guess: Manning will finish higher than fifth in the balloting for MVP in three months. Now that we’ve gotten the debate going—and I understand that I don’t have a player from the Cards or Bengals, the only unbeatens in football, on the list—I’ll look forward to hearing your arguments for the quarter-season MVP. I’ll use the best arguments you’ve got in my Tuesday Mailbag column. Steve Smith Sr., 35, had the best receiving day of the week, and he did it against his old team, and he didn’t crow afterward—well, almost didn’t. Dallas (3-1) beat New Orleans (1-3) by 21. Yeah, we all called that. If you had Arizona and Cincinnati as the only unbeaten teams in football exiting September, well, go to Vegas immediately and bet large sums on the first game you come upon. The Lions don’t blow games anymore. San Diego is a steamroller. Green Bay RELAXed. The Texans don’t need Jadeveon Clowney to dominate. Teddy Bridgewater and Blake Bortles are not supposed to be as poised as Andrew Luck and Russell Wilson, but they were in their starting debuts. Smith has had three 100-yard receiving games in his first four as a Raven. He’s on pace to catch 100 balls for 1,716 yards, which is fairly insane considering that in his last 18 games in Charlotte, Smith never had a 75-yard game, never mind 100. On Sunday, he said he got emotional only once. It came on his first catch of the day. If you saw the game, you saw something a little strange. Smith caught a pass near the line of scrimmage, looked and saw number 41, former Saints safety Roman Harper, in coverage, and slowed a bit. Then he creamed Harper with a stiff-arm. “I slowed down so I could stiff-arm him,’’ said Smith. The two men faced each other twice a year in the NFC South, and Smith carried a long memory from what he considered a cheap shot by Harper. He said he heard “through the grapevine” that Harper wasn’t sorry for the hit. And so if he had the chance Sunday, he was going to deliver a message. And there it was. Mike Glennon is better than you think. It’s been a bizarre year, and for all the wrong reasons, so far in Tampa Bay. Offensive coordinator Jeff Tedford had a heart procedure done during the summer, and he’s had to give up coaching duties for the time being, leaving his offense to be run and game-planned by people who are not Jeff Tedford (most notably quarterbacks coach Marcus Arroyo, a former Cal aide under Tedford). Starting quarterback Josh McCown was shaky and now is hurt, leaving the job to Glennon, the incumbent from last year who new coach Lovie Smith didn’t love. And it was Glennon who stepped into the huddle for a last chance with 40 seconds left at Pittsburgh on Sunday. Tampa Bay had the ball at the Steelers’ 46, no timeouts. And with star rookie wideout Mike Evans out with a groin injury, a player the Bucs just signed last week, Louis Murphy, was in the huddle. “I just said, ‘We’re ready for this. Let’s go. We need chunks.’ On second down, that famous Buccaneer combination, Glennon to Murphy, clicked on a 41-yard stroke up the right seam. “He was with us in camp,” said Glennon. “Great competitor. He stepped right in this week like he’d been there all along.” On third-and-goal from the five Glennon fired a pass to the left side of the end zone, and Vincent Jackson, who had come free, held on while hitting the ground with a thud. Glennon, the former North Carolina State starter (he pushed Russell Wilson out), called it “the most monumental win I’ve been a part of.” And the most unlikely outcome of the year, the 0-3 Bucs beating a team that destroyed Carolina on the road last week. Dennis Allen on the griddle. He should be, of course, because the Raiders’ 8-28 record since he took over before the 2012 season is the worst in football during that span. On Sunday night an Associated Press reporter tweeted that Allen would be replaced before his Tuesday press conference in Oakland. The reporter removed the tweet, and the Raiders said he apologized for it. “I will keep you posted,” a Raiders spokesman texted me early this morning. It’s just a matter of time for Allen, who cannot survive with a porous D plus Matt McGloin becoming the third starting quarterback in the last six weeks now that Derek Carr is out with a sprained knee ligament and sprained ankle. But if Allen is in jeopardy, what of GM Reggie McKenzie, who let a legit left tackle, Jared Veldheer, go; scotch-taped together a defense of veterans who’d seen better days; and paid real money to Matt Flynn and Matt Schaub to play quarterback and got results from neither. The sad thing for the Raiders is this will be their 12th straight non-winning season, and other than the glimmer of hope provided by this year’s rookie class—pass-rusher Khalil Mack has been promising, and Carr has had some good moments—the future looks similarly bleak. The logical replacement for Allen would be Tony Sparano, who I will guarantee will get his players to play hard for him. I don't know how well they'll play, but I know they will play hard. Teddy Bridgewater (age 21) started his first game. Against Atlanta he led six scoring drives in three quarters, completed 19 of 30 without turning it over, and left a good first impression. But Bridgewater is a smallish guy, and his second-half sprained ankle was a reminder of some of the reservations teams had about him before the draft. Blake Bortles (22) also started his first game, and his 29-for-37 (78.4%) day at San Diego was the most accurate quarterback debut in NFL history. He knew when to take off too (five rushes, 24 yards). Greg Bedard, who watched Bridgewater and Bortles on Sunday, has a full breakdown of their starting debuts. Ryan Tannehill (26) had a day of redemption, completing 74% of his throws in London to beat the moribund Raiders; he had 14 straight completions at one point. So much for the motivational ploy, or whatever that was last week from Joe Philbin, of not naming him the starter during the week. Andrew Luck (25) was the day’s most productive QB, 29 of 41 for 393 yards and four touchdowns in the 41-17 rout of Tennessee. “I’m embarrassed,” said Tennessee coach Ken Whisenhunt. Lots of coaches feel that way after facing Luck for three hours. 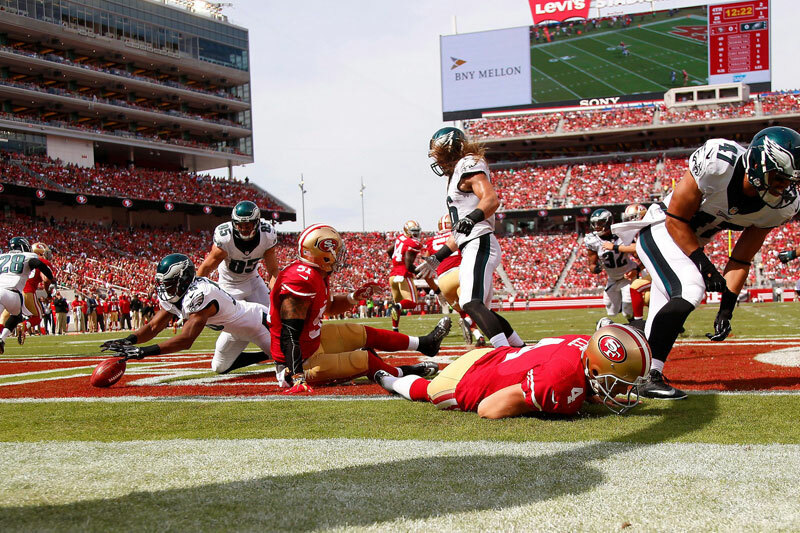 Colin Kaepernick (26) desperately needed the 26-21 win over Philadelphia, as did his team. Kaepernick (218 passing yards, 58 rushing) is surviving right now, not flourishing. 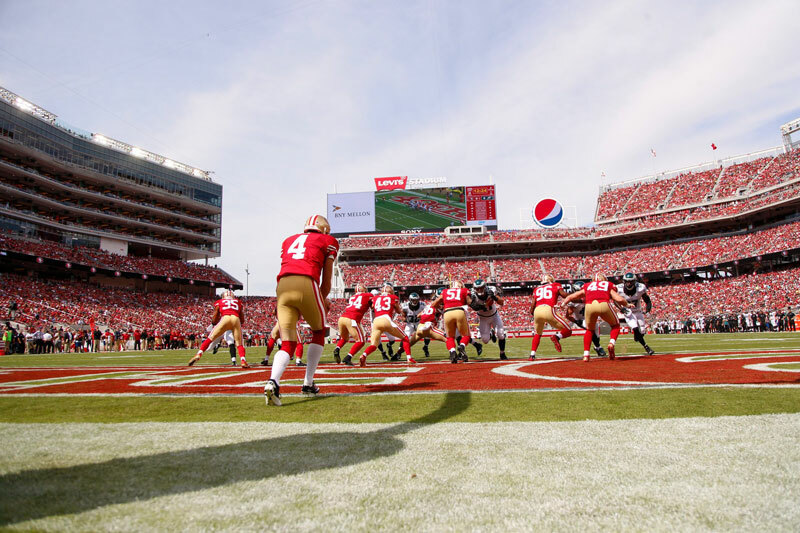 He’s just got too much leakage in his offensive front, and with tackle Anthony Davis and tight end Vernon Davis both getting hurt Sunday, Kaepernick could really use a bye. Unfortunately, that won’t come until Week 8. EJ Manuel (23). Okay, I’ve never been hounded by J.J. Watt for three hours before, so this is easy for me to say: But Manuel looked shaky at times in the loss to Houston—completing just 48% of his throws—and continued a troubling trend: His accuracy has been worse than the previous week in each of his last three games. Geno Smith (23) had another shaky day in the Meadowlands in the Jets’ loss to Detroit and cursed at a heckling fan while leaving the field after the game. The Jets (1-3) are watching their season slip away, and they’ve got to decide if it’s more important to give Smith training for the future than it is to try to win now with Michael Vick who, at this point, probably gives them a better chance to do so. Goodell in Austin over the weekend. On Saturday night he visited a domestic-violence hotline that the league is helping to fund in the wake of the firestorm. On Sunday morning, Goodell and the NFL’s executive vice president of football operations, Troy Vincent, had breakfast with 10 former players, including Ty Detmer, now a high school football coach in Austin. Later in the morning Goodell and Vincent met with Texas Longhorns coach Charlie Strong—who has dismissed nine players from the Texas program for disciplinary reasons since taking the job last January—to hear about being an old-school coach in a new-school era. Said Vincent: “The man is taking a stand. He made it clear that playing at Texas is a privilege, not a right. Basically, you have to be willing to let your best player go.” That was the message, too, from Hall of Fame linebacker Mike Singletary in the players meeting last week. Goodell is safe … for now. In the past several days I’ve spoken to high-ranking officials from eight teams, either the owner or high-ranking club officials with knowledge of the owners’ feelings, about the future of Goodell, with the proviso that they would not be quoted. Several points came through. There’s currently no movement or momentum to remove Goodell as commissioner. But there’s an asterisk there, as two of the owners said. They want to wait for former FBI director Robert Mueller’s report into the NFL’s actions in the Rice case. If Goodell is found to have lied about the Rice video or other pertinent facts in the Rice investigation, he’ll be in serious trouble. (Though no one I spoke to feel he has lied.) If he’s found to have been culpable, or not on top of the investigation in a material way, he could be in trouble as well. There’s more trust inside the ranks of ownership than in the wider population that Mueller’s report will be far-reaching and legitimate, although one owner agreed that it was a mistake for the chief investigator in the case to have ties to the NFL, as Mueller’s Washington firm does. More worrisome to Goodell may be his long-term future. One owner could see a scenario of Goodell surviving this fall, but if the brand is significantly damaged, and the public is as down on Goodell as recent public opinion indicates, he could be in trouble down the road. In general, the sense I got is that when the Mueller report is released, and if Goodell stays on, owners will urge him to concentrate more on league matters and growing and improving the game, and much less on discipline. Not a lot of support out there—anywhere—for Goodell these days. The MMQB dispatched staffer Jenny Vrentas to London last week to cover the future of football in Europe. Look for her in-depth report later this week. This morning she checks in with details on the commitment of NFL owners to playing games in Europe. LONDON — On Saturday morning, Michael Bidwill, the Cardinals team president, was here in a second-floor conference room at the Hotel Café Royal. Downstairs, Regent Street, the London equivalent of New York’s Fifth Avenue, had been shut down for a day-long NFL event that would draw an estimated half-million fans. Bidwill was talking to a forum of 150 or so of these European fans before the event started. His team wasn’t playing here in London—the Dolphins routed the Raiders, 38-14—but with the Cardinals on a bye, Bidwill decided to come check out the overseas operation. So he called Mark Waller, the NFL’s executive vice president of international, last Monday, six days before the game. “I wanted to see the facilities, the new Wembley Stadium, the fan experience, and really, have new data points," said Bidwill, whose family has owned the Cardinals for more than 80 years. “We are asked to consider lots of things about extending the series, and so I wanted to see what it was like." That’s a key point: Owners and team executives know how committed the NFL is to building its presence internationally, and that they’ll play a central role in where it goes from here. The league’s current resolution to play regular-season games in the U.K., as voted on by the owners, runs through the 2016 season, and Waller hopes to have a new resolution in place before that one expires. The NFL has steadily built up its presence in the U.K. since the first International Series game in 2007, and Waller believes the league will have a team in London in seven to eight years. But there would be many hurdles to clear and logistics to figure out in order for that to happen, including this: Owners would have to approve international games within the division and without a bye week on the back end, neither of which is permitted under the current resolution. In the short term, Waller says to expect three NFL games played at Wembley Stadium during the 2015 season (England is hosting the 2015 Rugby World Cup, with two matches scheduled at Wembley for Sundays in September, one reason the NFL will stick with three games). Two of those games will be played on consecutive weeks, to test how the stadium’s field holds up to that wear and tear. This is important, because if there were a team in London, its schedule would likely be played in two- to three-game blocks, home and away. The NFL’s international committee discussed plans for 2015 about two weeks ago. The Jaguars, who made a four-year commitment to the International Series, will be one of the “home" teams in London each season through 2016. Who else could be in the mix? Well, the league’s international committee has reps from nine teams, six of which have played in the International Series, and three that have not: Chiefs (Clark Hunt is the committee’s chair), Bills and Eagles. Those teams will be prime candidates in 2015. Bidwill told the panel of fans this weekend that the Cardinals, who played a preseason game in London in 1983, “would love to play another game—as the visiting team.” That’s the challenge for the NFL, finding more volunteers each year to give up a home game. If there were a team based in London (and, yes, the NFL wants that, more than a six- or eight-game collection of games featuring different teams), that question would be answered. But the NFL is not there yet. Archie Manning was home, watching his son Eli lead the New York Giants to a victory in Washington, when his phone buzzed with a text message. “Peyton," said Archie, “texted to tell me Jeter just got a walk-off in his last game at Yankee Stadium." Football was watching baseball Thursday, in some cases with one eye, the other on the New York-Washington game. The father of Giants tight end Larry Donnell is a big baseball fan, and though son was in the midst of a three-touchdown evening at the same time Jeter was playing his last game at home, Dad told him later he was flipping back and forth between Yankees and Giants. Presumably, Larry Donnell’s dad saw Jeter, in his last swing ever at Yankee Stadium, drive a single to right in the bottom of the ninth, his first-walk-off hit since 2007, to break a tie and beat the Orioles 6-5. The paths of the Jeter and Manning families have crossed numerous times. Charles Jeter, Derek’s father, helped the Mannings set up Peyton Manning’s PeyBack Foundation early in his career. Eli Manning sometimes called Derek for Yankee tickets. Peyton and Derek Jeter once had a very private dinner after a Monday night game in Indianapolis. “That night may have been the only night ever that [Indianapolis restaurant] St. Elmo opened for two people to have dinner: Peyton and Derek," Archie said. And in May, Peyton showed up at Yankee Stadium to see Jeter play. “I wanted to pay my respects and see him play for the last time," Peyton said that day. The dad too. At Archie’s restaurant, Manning’s, in New Orleans, there’s a private room downstairs, with spaces for three huge photos on the wall just outside the room. One is a blowup of last year’s Sports Illustrated “Sportsman of the Year” cover featuring Peyton Manning. Another is a blowup featuring all the SI covers of Archie, Peyton and Eli over the years. The third spot has been open. Said Archie: “I just told my restaurant manager yesterday, ‘That last spot, we’re getting a huge Derek Jeter photo there.'" “Let’s say you would compare a player in football who did what Derek Jeter has done. Who would it be? Jeter played 20 years and won five championships. In football, playing that long would probably translate to about 12 or 13 years. Jeter rarely got hurt, he played an important position, he had a very good skill set, he had characteristics as a player that raised the level of his team—attributes that you can’t see but are very important to a team winning. So he’s a championship player who played the game at a high level for a long time, playing a key position in his sport. Here are the three players I’ve thought of who he compares to in football: Emmitt Smith, Darrell Green and Ronnie Lott. Multi-championship players, players at the top of their game for a long time. I thought of Joe Greene too, and he might be a fourth one. They’re hard to find. In the scouting business, when you find a Jeter, or one of those football players I mentioned, it’s like striking oil." "I can’t tell you how much I love him. A couple of years ago, in spring training, I had a chance to spend 30 minutes with him. I wanted to talk to him about leadership, and about empowering some of our players to be leaders. He told me something I knew all along, but coming from him, it just meant more. It was words to the effect of, Leadership is more about what I do, not what I say. You don’t tell people you’ve got to run out every ground ball. You just run out every ground ball. I always liked what John Madden said about him the most: ‘Derek Jeter’s one of those guys you pick first. Then you decide what sport you’re playing.'" “The bigger the moment the better he performed. My favorite Jeter story was how he treated my son and his friend before a game. Such a classy guy. As a dad that was all you care about." Only fitting he go out that way," Brett Favre said. "Classy player. I’m honored to say I watched him play this year. "He’s the face of baseball, but it’s more than that: Everyone in athletics on all level respects Derek Jeter. I remember eight or nine years ago he comes to a game in Indianapolis to watch us play, and he comes down to the locker room after the game, and everyone’s in awe—the coaches, the players. I pointed him out to my 4- or 5-year-old grandson that night and told him what a great player he was. He still remembers that to this day." "They should retire No. 2 in baseball. Definitely one of the greatest athletes ever." “Even as a Mets fan I have to admit Derek Jeter did it the right way. On our [WFAN] radio show I came up with a clear and concise piece of advice for all of today's athletes. Simply ask yourself, ‘WWDJD? What would Derek Jeter do?' If every athlete thought that way it may be boring but boy, would there be a lot less trouble." “My favorite Derek Jeter moment happened July 2004 in the 12th inning of a tie game versus the rival Red Sox. Jeter tracks a fly off the bat of Trot Nixon, makes a sensational catch and dives head-first into the stands. The Yankees won the game in 13 innings. Jeter's postgame comments were classic: ‘I always play hard and lead by example. That’s my job.’ That moment stuck with me as I headed into my first NFL training camp." “With all the great things he did on the field my favorite with Jeter would be him taking time to have a conversation and take pictures with my dad during batting practice one day at Yankee Stadium. The way he ended it with the walk-off was unbelievable. I thought hitting a home run for his 3,000th hit was crazy but how he ended his Yankee career is fitting for how he played the game. He deserved to go out with a bang like that." “I have always appreciated greatness in sports—but I appreciate greatness in the biggest moments and at the most critical times even more. Many have proven to be great, but only few have proven to be even greater in the biggest moments of their career, that to me is what defines Derek more than anything else. If you had to pick a guy for one play or one at-bat in a critical situation, who would you choose? Derek would be on that list. To me, the greatness compliment a great player could get is: ‘Were they the best when it counted the most?’ That is how I will remember Derek Jeter. I hope a few would see my career the same way." "He truly does epitomize everything you want to be as an athlete on and off the field. He was always focused on winning, working harder then the next man, and he always kept the standard extremely high for himself and for his team. For him to do it at that high of a level, and to do it in that market for 20 years, is just remarkable. I definitely tip my hat to him. Respect." "Couldn’t help but think of another favorite baseball farewell—Ted Williams’ final at-bat at Fenway Park. [Williams homered, and never stepped to the plate again.] Think it was against Baltimore as well. [It was.] My best Jeter memory is the 3,000th hit, a big home run, or maybe the back-handed flip with the cutoff in the playoffs. Awesome stuff." "I’m the PR director in Tampa, and my wife and I pull into a Carrabba’s for dinner. I go to the men’s room to wash my hands before we eat and there he is, in back, eating with Gerald Williams. I tell my wife, ‘Guess who’s eating dinner back there? It’s Jeter!’ She goes back later and says to him what a big Yankee fan I am. And 30 minutes later, he finishes his meal, comes up to our table, and introduced himself. He could not have been nicer. What a class act and what a great player." “I know Derek personally. I don't have a particular story but through the times we hung out and I played golf at his celebrity event in Tampa, he is just a down-to-earth, real guy. You would sometimes expect someone with his accomplishments to be slightly arrogant and not friendly but he was neither. What happened to him in his last game at Yankee Stadium was amazing and couldn’t happen to a better guy." “I do have a favorite Jeter story. A buddy of mine, Luke Wilcox, played in the Yankees’ farm system. He played with Jeter growing up and when he got called up, he went and tried to bust Jeter's balls in the locker room. David Justice and some other guys went up and told him directly, ‘You don't address the captain like that.' He was terrified." 1. Seattle (2-1). Coming off the bye, the Seahawks will put on their traveling pants, with trips that are three, two and three time zones away over the next four games: at Washington (next Monday), Dallas at home, at St. Louis, at Carolina. The last two will be early games in Eastern Time. Tough stretch. 2. Cincinnati (3-0). I never remember, in any non-Super Bowl season, the Bengals being as popular and as celebrated on and off the field as they are right now—and I am pretty familiar with the franchise history, having covered the team for the Cincinnati Enquirer in 1984. Lose two coordinators, start 3-0. Have the quarterback under fire, and Andy Dalton starts like an All-Pro player. Partially rebuild the offensive line, allow zero sacks in the first three games. And off the field, they’ve handled Devon Still and his daughter’s cancer surgery so deftly, donating more than $1 million from the proceeds of Still’s jersey sales to cancer charities. Mike Brown’s long been seen as a skinflint. Not now. 3. Denver (2-1). Who’d have thought the game of the week in Week 5, between two teams with a total of one loss, would be Arizona at Denver? 4. Arizona (3-0). Coach of the Month: Bruce Arians. Quote of the Month: Bruce Arians: “It’s a short elevator ride back to the s---house. People, all of a sudden, I’m the greatest damn coach in the world. I’ve been a sorry SOB for 17, 18 years now. That ain’t changed just because we won a couple of games." 5. San Diego (3-1). The Chargers’ slate, prior to a Week 8 showdown at Denver: Jets (1-3) at home, at Raiders (0-4), Chiefs (1-2) at home. 6. Baltimore (3-1). Won three straight, by an average of 17.3. That was a beatdown of the Panthers on Sunday. 7. Detroit (3-1). Impressive performance by the Lions, and by a pressured Matthew Stafford in particular. Facing one of the best three or four defensive fronts in football, Stafford played a mistake-free (two touchdowns, no interceptions, 70.6% passing) game to beat the Jets. 8. San Francisco (2-2). One thing you learn about the Niners under Jim Harbaugh in his three and a quarter seasons as coach: They don’t stay bad for long. 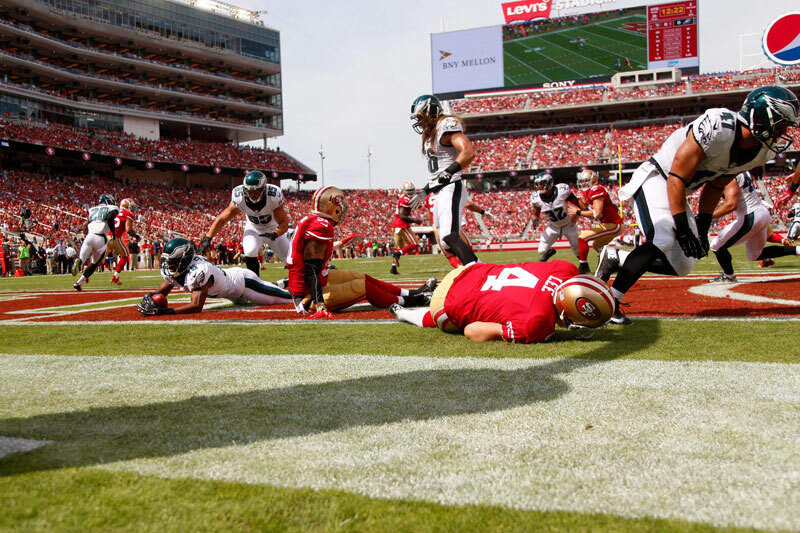 The win over Philadelphia proved again that when the 49ers face adversity, they respond pretty well. In 52 regular-season NFL games coached by Harbaugh, he’s never had a three-game losing streak. 9. Philadelphia (3-1). Predictable loss. On the bright side, one of the great catches of this or any season, the sideline one-hander by Jeremy Maclin. 10. New England (2-1). If you’re the Chiefs and you have to play the Patriots at some point this year, now’s the time. I’d be blitzing from the first second-and-long if I’m K.C. defensive coordinator Bob Sutton. 11. Dallas (3-1). Cowboys number 11. Just one more example how, in football, nobody knows anything. 13. Indianapolis (2-2). In his first two seasons Andrew Luck has thrown for 4,374 and 3,822 yards, respectively. He’s on pace for 5,220 through four weeks, which makes our Andy Benoit (who thinks Luck will be the best quarterback in football by season’s end) quite happy. Oh, and Luck is on pace for 52 touchdown passes. 14. Houston (3-1). If you discuss candidates for the NFL MVP after four games, J.J. Watt has got to be in the conversation. 15. Minnesota (2-2). Vikings are the NFL’s Psycho Team. Lose Adrian Peterson, fall 30-7 to the Patriots two days later. Then they lose at New Orleans, predictably, and the season is on the way to Free-Fallville. Then they put in the rookie quarterback, and they roll past the leaders in the NFC South, Atlanta, 41-28. Steve Smith Sr., wide receiver, Baltimore. The day couldn’t have gone any better for Smith, playing his first game against the team that brought him into the NFL 13 years ago: seven catches, 139 yards, two touchdowns, a 19.9-yards-per-catch average. What’s significant about Smith’s production so far is that he went to a team that didn’t really need him, and he’s played so well that he’s forced balls to come to him and not to Torrey Smith or Jacoby Jones. Steve Smith has been targeted 42 times through four weeks, Torrey Smith and Jones a combined 31. He’s one of the revelations of the first month of the season. Teddy Bridgewater, quarterback, Minnesota. Good and bad. The good: He threw for 317 yards in his first NFL start, looked as poised as a seventh-year starter, led six scoring drives and engineered an upset of the Falcons. The bad: He sprained his ankle late in the game (X-rays negative, but MRI last night), and the Vikings have a short week before playing at Green Bay on Thursday night. But Bridgewater’s poise and performance were very encouraging. The Vikings gave serious consideration before the draft to picking Johnny Manziel over Bridgewater; this performance, and Bridgewater's seriousness of purpose, are very positive early signs that they made the right call. J.J. Watt, defensive end, Houston. On a day with some stunning defensive plays, Watt’s interception and 80-yard return for touchdown was the best. Watt halted a third-down pass-rush in the third quarter against Buffalo because he smelled a pass in the flat to Fred Jackson. Diagnosis perfect. E.J. Manuel tossed a rainbow in Jackson’s direction, and Watt jumped high and stole it in mid-air. He then outran Manuel and Jackson straight downfield for the long touchdown. That wasn't all for Watt. He had nine quarterback pressures for the day. In a discussion about the best defensive player in football, it would have to be for second place. Vic Fangio, defensive coordinator, San Francisco. 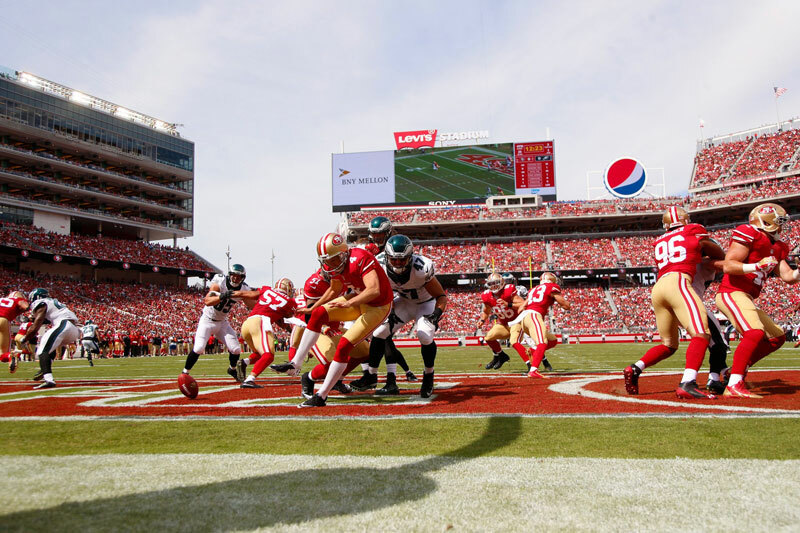 Philadelphia was the league’s hottest offensive team coming into Sunday’s game, and the Niners, minus defensive core players Aldon Smith (suspended) and NaVorro Bowman (rehabbing a knee injury), were getting gouged on defense. Fangio’s secondary played the Eagles receivers very physically, and shut down LeSean McCoy. The Eagles got 21 points (none from the offense) and 213 yards, both season lows. And again the Niners rose to the occasion in a game they had to have—this time, thanks to the diminished defense. Trey Burton, tight end, Philadelphia. 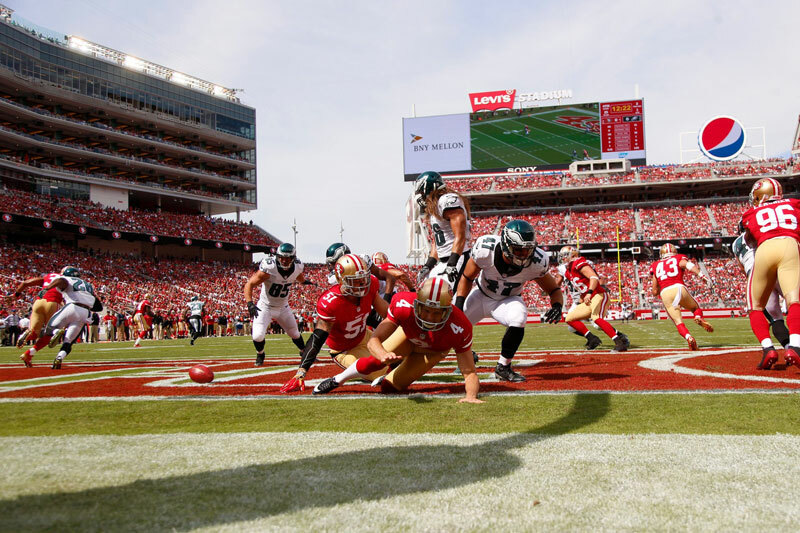 The Eagles’ fourth tight end, an undrafted rookie from Florida who was one of the most versatile players in recent Gator history, executed a perfect punt rush in the first quarter against the 49ers. 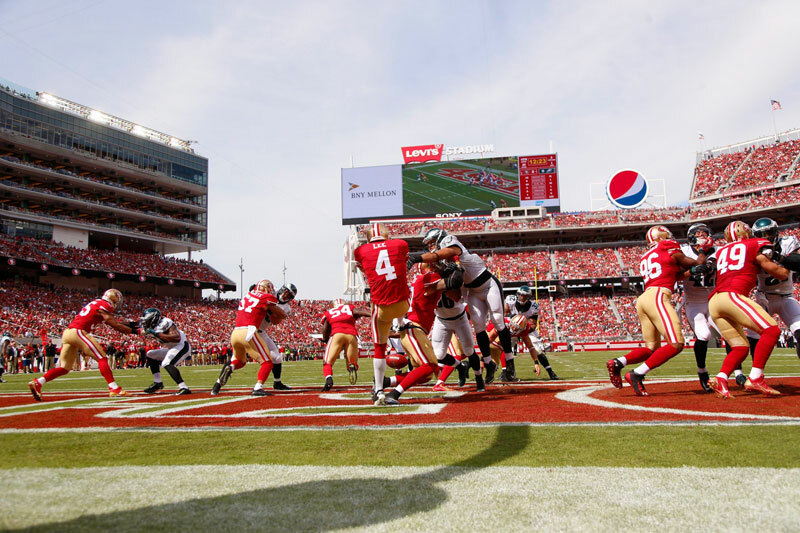 He and teammate Bryan Braman combo-blocked Niners linebacker Dan Skuta, pushing Skuta back into the face of punter Andy Lee, who was standing near the back of the end zone. Burton reached his left arm over Skuta and whacked the ball to the ground as Lee tried to rush his punt. 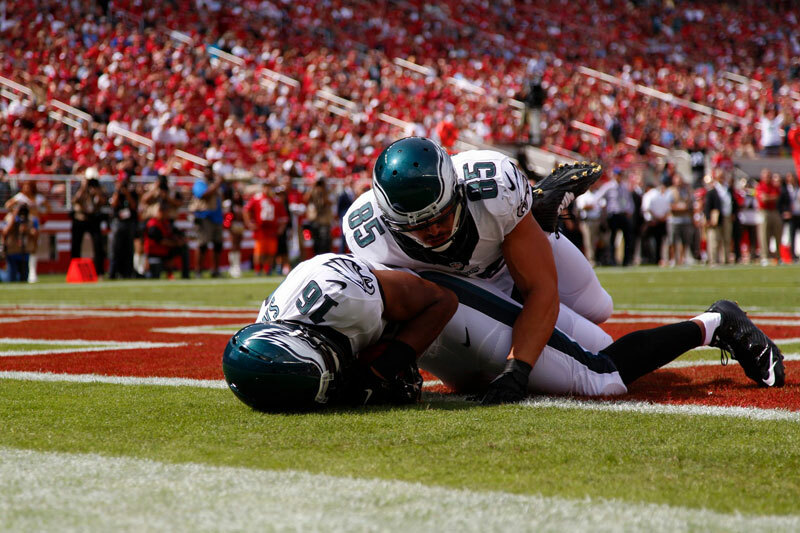 Eagles wideout/special-teamer Brad Smith recovered for a huge early touchdown. I doubt many people had Trey Burton as a big impact player in Eagles-Niners. Darren Sproles, running back/punt-returner, Philadelphia. 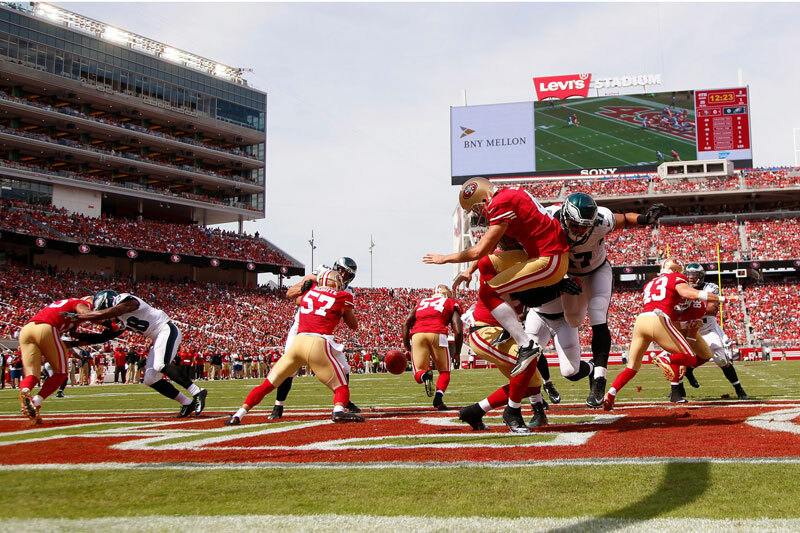 A quarter after the great play by Burton resulted in the first special-teams touchdown of the day for the Eagles, Sproles took an Andy Lee punt at the Philadelphia 18-yard line, got his face mask grabbed by Niners gunner Kassim Osgood (it was flagged) and had his head yanked to the side as he started the return. No matter. 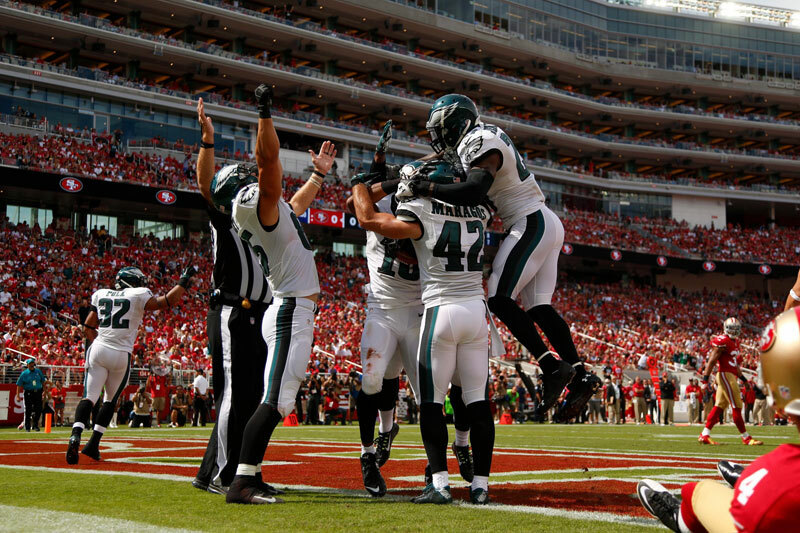 He sprinted 82 yards down the right sideline for the touchdown—and the Eagles had two special-teams touchdowns in the first 22 minutes of the game. Brad Wing, punter, Pittsburgh. Wing’s feeble 29-yard punt with 50 seconds left put the ball on the Pittsburgh 46, giving the Bucs, trailing 24-20, a short field to traverse to try to win the game. And win it they did, on a great Vincent Jackson catch in the end zone with seven seconds to play. “I’m 35 yards old. I just ran around those guys like they were schoolyard boys." —Baltimore wide receiver Steve Smith Sr., after his two-touchdown, 139-yard performance in the Baltimore rout of Smith’s old team, the Carolina Panthers. “The bottom line is that we are an undisciplined group. We are too highly penalized. So I take responsibility for that. We are not going to win close football games being penalized in the manner in which we’ve been penalized over the first month of the season. It’s unacceptable. It’s inexcusable. In a nutshell, that is the story of the outcome of the performance. We gotta fix it. I gotta fix it. And I will." —Pittsburgh coach Mike Tomlin, after the Steelers lost to Tampa Bay 27-24 at home Sunday—and committed 13 penalties for 125 yards in the process. For the season, Pittsburgh has had 44 accepted penalties flagged on the team in four games. "I’d do it again, brother." —Lions linebacker Stephen Tulloch, to the Detroit Free Press, on tearing his ACL and being lost for the season eight days ago. It was the way he was lost, though, jumping up and down while imitating Aaron Rodgers’ touchdown celebration, after a sack against the Packers. —Derek Jeter, asked what he was thinking as he stepped into the batter’s box last Thursday for the last at-bat of his 20-year career at Yankee Stadium. The Colts’ 41-17 victory over Tennessee in their second division game of the season got me thinking about how vital the franchise quarterback is in today’s game. While the rest of the AFC South has struggled to find and develop The Man, the Indianapolis Colts, obviously, have not. Since the AFC South was born in the NFL redistricting of 2002, the only year the Colts were bankrupt at quarterback was 2011, when Peyton Manning sat after neck surgery and the Colts went 2-14—Curtis Painter, Dan Orlovsky and Kerry Collins all started games at QB—enabling them to draft Andrew Luck. The other 12 seasons, Indianapolis has not had to worry about the future at quarterback. Meanwhile the Titans have lurched from the final years of Steve McNair to Vince Young to Collins to Matt Hasselbeck, and it’s very much in question whether Jake Locker can be the long-term solution. Houston has gone from David Carr to Matt Schaub to Ryan Fitzpatrick, with no indication if current backups Tom Savage or Ryan Mallett could be the future. In Jacksonville, Byron Leftwich, David Garrard, Blaine Gabbert and Chad Henne have tried; Blake Bortles is the current hope for the future, and he had his first start Sunday in San Diego. So the jury is out there too. Meanwhile, the Colts have won two-thirds of their regular-season games since Luck was drafted. They’re 24-12 since 2012. Philadelphia running back LeSean McCoy, one of the game’s best backs, has 39 yards rushing over the past two weeks. Minnesota rookie back Jerick McKinnon had 55 yards rushing on his first snap of the second quarter Sunday afternoon. Unless the Yankees one day have a player wear the number “0,” Sunday was the last day ever that a Yankee will wear a uniform with a single digit on the back. Derek Jeter’s No. 2 will be retired soon, and the rest of the single digits are already retired. “Players, no matter what position, admire toughness. You look at just what this building is like when [former Eagles safety] Brian Dawkins shows back up. There is an admiration for someone that's just a tough, hard‑nosed football player. I think you've got to respect Nick. I've said it all along: I saw him do it in college. We hit the heck out of him when we were at Oregon and he played at Arizona, and he just kept getting up and throwing and standing in there. I think it's a very underrated quality for a quarterback. It's not something you can see at a pro day. It's not something you can see at the combine. They're never getting hit. They're doing everything in shorts and T-shirt. You've really got to study the tape. It's a quality in this league that you have to have. Because no matter who you are playing, you're going to get hit. You've got some big, angry people running after you and trying to take you down. To stand in there and not worry about it and know you're going to get hit but you have to deliver the ball on time is a really underrated quality at that position. Right now he's really shown what I've seen all along from him. It didn't take the Washington game for them to admire his toughness." I Ubered the other day. Finally joined the crowd—am I the last person in the United States to download and activate the app?—and now I understand what the fuss is all about. My dermatologist’s office is in Winchester, Mass., a 20-minute drive from Boston (in moderate traffic). Even though I live in New York, I’ve kept the same dermatologist, because she’s so thorough. So I had an appointment last Wednesday at 7 a.m. I took the train up from New York on Tuesday, checked into a hotel in Boston and got up Wednesday morning for the trip out. I decided to cab out and Uber back, to compare the price and the experience. The cab was a cab, 23 minutes door to door, for $32.10 ($40 with tip). The doctor’s office is on a busy street in Winchester, a suburb. I punched in my info on my phone, and the app told me the driver was four minutes away. Five minutes later he drove up in a 1-year-old Toyota RAV4. Very clean. A quiet but friendly driver navigated through heavy traffic and got me to Boston South Station for the train home in 41 minutes. Cost: $23.01. If that had been a cab, with the longer trip, my guess is it would been between $45 and $50, including tip, because of how long we crawled in traffic down I-93 into Boston. I haven’t followed the taxi-versus-Uber battle in the country, though I’ve heard about it. I also cannot draw definitive conclusions based on one experience. But I will say this: Based on my Wednesday experience, I will certainly be using Uber again, and probably often. The first-round rookie of the Philadelphia 76ers, watching Eagles coach Chip Kelly call pass plays—both incomplete—on third and fourth downs from the Niners’ one-and-a-half-yard line late in the fourth quarter. Though Shady McCoy was available, the Eagles have been terrible running the ball, and Kelly certainly figured they’d have a better shot with the ball in Nick Foles’ hands twice. The New York Daily News writer, after Geno Smith’s underwhelming performance in the 24-17 home loss to Detroit. CBS2 is the CBS affiliate in New York City. Smith, speaking to the press after the game, apologized for losing his patience with the fan. I think it says a lot about Bill Belichick that rarely does anyone—player or coach—succeed away from him. The Bleacher Report analyst after Kansas fired former Patriot offensive coordinator Charlie Weis on Sunday. Sad that Derek Jeter's final home game may be rained out, but for $24.99, you can buy a commemorative raindrop. My Sports Illustrated colleague, as the rain poured down during the day Thursday. Most everything Jeter-related has been for sale in the past six months. Why not the rain? a. That fake jet sweep and handoff to Matt Forte on the first drive of the game for Chicago. Eight-yard gain. Marc Trestman isn’t the first to use it, but he knew to use it effectively. b. Trestman, by the way, is a terrific play-caller. Check out how wide open Alshon Jeffery was on his first-half touchdown catch, made possible because of a great misdirection concept by Trestman. c. Steve Smith’s superb stiff-arm of Panthers safety Roman Harper on his first reception in the Rivalry Bowl. d. Pat McAfee’s perfectly placed onside kick against Tennessee. e. The touchdown-saving strip by Tampa Bay cornerback Johnthan Banks on a near-TD pass by Ben Roethlisberger. f. Speaking of outstanding strips by men with names that approximate “Jonathan,” Houston’s Johnathan Joseph had a gorgeous one against the Bills too. g. C.J. Spiller. If the NFL had a “Making People Miss” stat, Spiller would be in the top five. h. And Spiller’s block on J.J. Watt—that’ll be replayed to the howling delight of every Bills offensive player during team film sessions this week. i. Throw of the day: Cam Newton’s gorgeous 30-yard line drive, threaded perfectly to Jerricho Cotchery. j. The toughness of Jordy Nelson. k. I know it didn’t count, but that TD throw by Aaron Rodgers (negated by penalty) while getting whipsawed in the pocket has to be one of the finest throws of his life. l. Great pick and run by Brent Grimes of the Dolphins in London. m. Hand it to Geno Smith: After a brutal first half, he took the Jets down for a must-have touchdown, finishing it off with a touchdown pass to a wounded Eric Decker. n. Great news tidbit from Albert Breer on NFL Network: E.J. Manuel is working with a “mental conditioning coach" from Florida State. Presumably to feel better about himself. o. Good column by Gary Myers in the New York Daily News on Sunday. How ironic it would be if the Jets had to negotiate with fired GM Mike Tannenbaum if Rex Ryan is dismissed as coach—after this season or any season? Tannenbaum, who now works as an agent, has a hot defensive coordinator, Seattle’s Dan Quinn, in his stable. p. Green Bay’s seven possessions Sunday: TD, TD, TD, field goal, TD, TD, missed field goal. I’d say the offensive slump is in the rear-view mirror. r. The 29th straight field goal by Dallas kicker Dan Bailey. Kicking's not an adventure in Dallas anymore. It's a lock. a. Me, for praising Le’Veon Bell as a complete player. It was Bell’s matador block in pass-protection on a Bucs pass-rusher that led to Michael Johnson’s strip-sack of Ben Roethlisberger early in Bucs-Steelers. b. The horrendous call by the Terry McAulay crew on the first drive of Bears-Packers, calling hands to the face on Green Bay’s Julius Peppers—when it was obvious the call should have been against Chicago tackle Jordan Mills. c. The horrendous non-call by Walt Anderson’s crew against Antonio Brown, who pushed off in the end zone before catching his first-half TD against Tampa Bay. d. The Bears, not throwing into the end zone on the last play of the second quarter. Cost them dearly. e. I can only assume Jay Cutler thought Brandon Marshall was going to curl on that Sam Shields pick. Otherwise, that is one heck of a bad decision by Cutler. f. Terrible decision by Geno Smith on the crucial third-down snap inside of four minutes and down seven, dumping it off to Chris Ivory four yards short of the first down … and terrible hands by Ivory, dropping a ball right in his hands. g. Whoa. The Panthers have given up 75 points the last two weeks. Foes: 5.7 yards per rush. h. Terrible protection for Colin Kaepernick early against the Eagles. 3. I think I’m still trying to figure out what Joe Philbin was trying to do, motivationally, by not announcing who his starting quarterback was last week. I also think I am not alone. Miami's rout of Oakland doesn’t change that. 4. I think it’s a great idea that NFL owners will consider making all personal-foul calls replay-reviewable in 2015; NFL Network’s Ian Rapoport reported Sunday such a measure is likely to be approved before the 2015 season. I’ve got a further suggestion: Make everything replay-reviewable—every call, every non-call. It is certainly possible, and happens often, for calls that are not made to be as important as incorrect calls that are made on the field. 5. I think I will head off at the pass anyone who says making everything reviewable will make games eight hours long. I’m not advocating expanding the number of replays beyond the current two per team per game. Would there be an increase in reviews? Possibly. But if it makes the game more legitimate, with fewer blown calls, it’s worth it. 6. I think we vastly overestimated the Saints. Not only on defense—Rob Ryan’s unit isn’t even mediocre; it’s bad—but the offense is not nearly as reliable as a normal Drew Brees offense. The worrisome thing I saw Sunday night was the continuation of a trend that’s plagued the Saints often during the Payton years: They’re awful on the road. Since the start of the 2013 season, New Orleans is 9-0 at home and 4-9 away from the Superdome. The pass-rush isn’t there as it was late last year, and the Saints haven’t had consistent play in the back end around cornerback Keenan Lewis; plus, ace safety Kenny Vaccaro is still recovering from late December ankle surgery that ended his 2013 season. He doesn’t look the same. The Saints can rebound from 1-3, because there’s not a super team in the NFC South. But the ugliness of the first month won’t be easy to overcome. 7. I think if I ran the NFL, and I had the kind of image problem (crisis, really) that the NFL has right now, I’d be looking for people who are universally respected to help me dig out of the hole. I’ve got one: former Saint Steve Gleason. One of the most unselfish NFL alums I’ve met, Gleason, as you probably know, suffers from ALS, but that hasn’t stopped him from working daily to live as full a life as he can, and from working to find a cure for ALS. Coincidentally, Gleason will be in Roger Goodell’s office Tuesday with his friend Scott Fujita. I’d love for it to be more than a hey-how-are-you visit. Gleason has the attitude and the intelligence to bring new ideas, and a sounding board, to the league. 8. I think some people in Wisconsin are trying to do some good in the face of a tragic illness facing a very good man and journalist—Tom Mulhern of the Wisconsin State Journal. In August, Mulhern, who has covered the Packers and the Wisconsin Badgers football team, was diagnosed with a rare neurological disorder, Creutzfeldt-Jakob Disease, that is usually fatal within a year. Packers quarterback Scott Tolzien, whom Mulhern covered, has become a visitor recently to cheer Mulhern, and friends in the business like Jason Wilde of ESPN-Milwaukee are spearheading a scholarship drive. The University of Wisconsin is establishing a scholarship for sports journalism in Mulhern’s honor, and wouldn’t it be great to get the scholarship funded while Tom Mulhern can appreciate it? To donate, go here. Not long after being diagnosed, Mulhern told Wilde, “When you start adding it up, I’ve been pretty lucky.” Those who have known Mulhern and been influenced by him say they’re the lucky ones. 9. I think if Bill Simmons has proof that Roger Goodell lied, then I’ve got no problem with what he said that caused ESPN to suspend him for three weeks. If it’s his opinion that Goodell is lying, then I’ve got a problem with it. How do you publicly say someone is lying and is a liar—adding profanities for emphasis—without knowing for sure? a. One thing about this baseball season that I loved: the rise of the middle class. Kansas City in the playoffs (the coolest thing about the season), Pittsburgh in the playoffs again, Oakland (barely) in the playoffs, Seattle knocked on the door, Baltimore in the playoffs. b. Dustin Pedroia’s Venezuelan twin, Houston second baseman Jose Altuve, finished with 225 hits—25 more than any other player in baseball. c. Jordan Zimmermann might have thrown the least-celebrated no-hitter in memory Sunday, because of the meaninglessness of the game and it happening on the day of Jeter’s last game and on a big NFL Sunday. But let it be noted he was one walk shy of a perfect game, and the game was played in 2:01.
d. Let is be noted, too, that the catch by someone named Steven Souza Jr. to end the game was quite likely the greatest play to finish a no-hitter in major-league history. Have a question or comment for Peter? Email him at talkback@themmqb.com and it might be included in Tuesday mailbag. e. Bummer. No sudden-death 163rd games today. f. Have you ever seen Being There, the Peter Sellers movie about the simpleton gardener-turned-presidential adviser? What a movie. Watched it again over the weekend. A shame Sellers died too soon. He was brilliant in that film. g. There’s a strange late-September week in New York every year: U.N. Week. It’s when the United Nations General Assembly is in session, and last week was the big week this year. Many streets on the east side of town (the United Nations is located on the far east side of Manhattan, along a several-block stretch around 45th Street) are blocked off, and for larger ones a special lane is barricaded so police vehicles and cars with diplomatic plates can come and go quickly. Security is quite tight. On Friday evening, I counted 106 police officers (and who knows how many plain-clothes officers I missed) in a 10-block walk along Second Avenue. h. Kansas fires Charlie Weis. I bet Charlie Weis would like to have this last decade back. i. So long, Paul Konerko. I hope someone notices you’re retiring too. j. Shouldn’t a man with more home runs in his career than Johnny Bench, Andre Dawson, Cal Ripken Jr., Mike Piazza and Jim Rice get a little more fanfare on the way out? k. April 2015: Jeter out, A-Rod back. That’s one heck of a trade. l. Wishing Ben Bradlee, one of the true journalism giants, comfort these days. Word comes today that the longtime Washington Post managing editor is in hospice care. I've always been a big fan. m. Ran 10K on Saturday (not a race, just a 6.2-mile run) in 59:02. Chickened out at the thought of running the Central Park hill again. I appreciate the comments on running that I’ve gotten from many of you. Hope to get a Saturday race in one weekend this fall. Any recommendations for one around New York City? n. Coffeenerdness: Starbucks Anniversary Blend is out, and it’s good, but it’s no Italian Roast. o. Beernerdness: It’s a bold beer, and I recommend it highly: The Great Pumpkin, by Elysian Brewing Company in Washington. Yes, it’s that time of year when I’ll be trying many of the pumpkins. Always a worthy endeavor. New England 30, Kansas City 20. Good point from ESPN Stats & Info on the pressure Tom Brady’s facing. He’s under pressure on 25.6% of the snaps through three weeks, triple what it was four years ago. This is a very big week for the Patriots, at least to me. The narrow win over Oakland looks especially weak in the wake of the Raiders’ horrible performance in London against Miami. But I trust Tom Brady to make plays tonight more than Alex Smith. Who thought they'd be 3 and 1?